Cook Spud Puppies potatoes according to package directions, but make sure to cook them until very crispy (about 30 minutes). Meanwhile, heat a large oven-safe skillet over medium heat. Cook the bacon until crisp. Drain on paper towels and then crumble into pieces. Drain all but 1 tablespoon of bacon grease from the skillet. Add 1 tablespoon olive oil and when hot add the diced onion, red pepper and jalapeno. Season with salt and pepper, saute for 5-8 minutes or until soft. Add the black beans and cook 1-3 minutes or until warmed through. Remove from the heat and, using a spatula, place the mixture onto a plate. Preheat the oven to 450°F. Arrange half the Spud Puppies in the bottom of the skillet (used for cooking the bacon and peppers) or use a baking sheet. Sprinkle half the pepper mixture over the top of the Spud Puppies, and then add half the cheese. Add the remaining Spud Puppies, pepper mixture and cheese. Bake for 5-10 minutes or until the cheese is warm and melty. While the nachos bake, place the avocados, lemon juice, chopped cilantro and a pinch of slat and pepper in a bowl. Lightly mash the avocados. Stir in 2 chopped green onions. Remove the nachos from the oven and sprinkle the bacon over top. Dollop with the mashed avocado. Serve warm with sour cream, salsa and/or hot sauce if desired. What are tater totchos? They're a layered nacho dish but instead of chips, they have tater tots ... and bacon ... and cheese. Enough said. Things are getting pretty darn good around here. Spring is right around the corner and the Irish are taking over my kitchen. Or, well, my Irish brother is taking over my kitchen. This is kind of a good thing, but mostly bad. The bad is that all he eats is beef. So much beef. It is a little tiring. The good is that he once lived in Ireland for a semester, meaning he loves corned beef and potatoes in any way, shape or form. Since tater tots are one of his favorite forms of the potato, and with St. Patrick’s Day coming up, I thought an Irish twist on classic nachos would be perfect! And really, what's not to love about tater tots covered in cheese and bacon? Gather up your ingredients. I love using Cascadian Farm Spud Puppies taters. I swear they are the best out there … and I kind of love the name too. Sauté some onions and peppers, and if black beans are your thing, throw those in too! Grab those crispy Spud Puppies! Spread the tots in an even layer and then layer on the pepper mixture. Now add some cheese. Repeat with another layer of each. Now pop them into the oven to melt the cheese. Meanwhile, mash the avocados and gather up any other toppings you like. 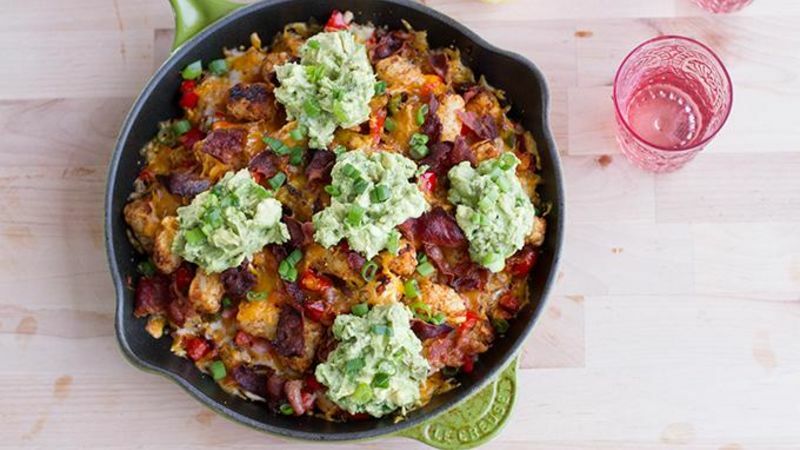 Grab the nachos from the oven and toss on the crumbled bacon! Serve 'em up and grab a beer! Tieghan thanks Family Fresh Cooking for photo inspiration. To find more of Tieghan's recipes, visit her blog Half Baked Harvest, and check out her Tablespoon profile, too!